This wholesome, grain-free recipe is specifically formulated for your growing puppy. It contains chicken & turkey liver with a combination of natural proteins for optimum nutrition. chicken, turkey liver, chicken meal, pork meat meal, lentils, peas, chickpeas, potatoes, pea flour, dried whole egg, pork fat (preserved with mixed tocopherols), dried tomato pomace, salmon oil, (preserved with mixed tocopherols), sweet potatoes, pea protein, duck, quail, guinea hen, flaxseed, alfalfa meal, carrots, broccoli, spinach, monosodium phosphate, potassium chloride, salt, chicory root extract, yucca schidigera extract, sodium selenite, folic acid, parsley, sorbic acid (preservative), vitamins [vitamin A acetate, vitamin D3 supplement, vitamin E supplement, vitamin B12 supplement, choline bitartrate, niacin supplement, d-calcium pantothenate, L-Ascorbyl-2-polyphosphate, riboflavin supplement, thiamine mononitrate, pyridoxine hydrochloride, biotin], minerals [zinc sulfate, ferrous sulfate, manganous sulfate, magnesium sulfate, copper sulfate, cobalt carbonate, calcium iodate, iron proteinate, zinc, proteinate, copper proteinate, manganese proteinate, magnesium proteinate, cobalt proteinate], dried Lactobacillus acidophilus fermentation product, dried Bifidobacterium longum fermentation product, dried Lactobacillus plantarum fermentation product, dried Pediococcus acidilactici fermentation product. Protect from moisture. Keep in a cool dry place. 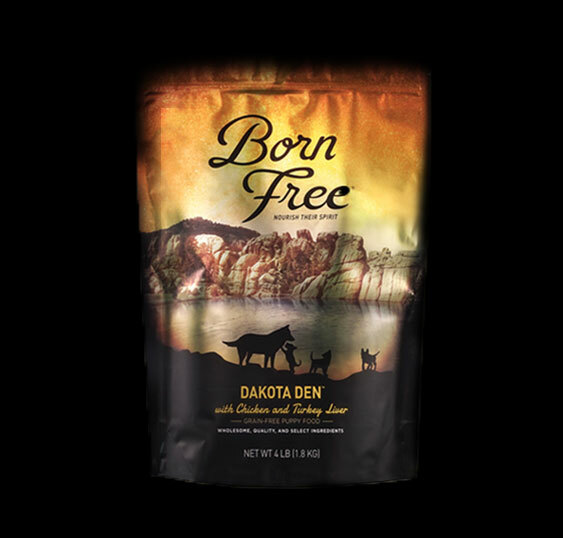 Born Free Dakota Den™ with Chicken and Turkey Liver Grain-Free Puppy Food is formulated to meet the nutritional levels established by the AAFCO Dog Food Nutrient Profiles for gestation, lactation, and growth. Age, breed, weight, activity level, and other factors have an effect on the amount of food required. Two to four times more food may be required for puppies, gestating dogs, and nursing dogs. *The amount of nutrients supplied by a specific food on a typical basis. The data presented is based upon both calculated values using expected data from various ingredient databases and actual lab analysis. They provide more detailed information than Guaranteed Analysis but are in no way intended to represent absolute values. Receive updates and deals on everything Born Free. chicken, chicken meal, peas, lentils, chickpeas, pea flour, turkey, tomato pomace, chicken fat (preserved with mixed tocopherols), dried whole egg, pea protein, sweet potatoes, duck, salmon oil (preserved with mixed tocopherols), potatoes, cheese, quail, guinea hen, flaxseed, monocalcium phosphate, alfalfa meal, carrots, parsley, broccoli, spinach, potassium chloride, calcium sulfate, salt, chicory root extract, yucca schidigera extract, sodium selenite, folic acid, sorbic acid (preservative), vitamins [vitamin A acetate, vitamin D3 supplement, vitamin E supplement, vitamin B12 supplement, choline bitartrate, niacin supplement, d-calcium pantothenate, L-Ascorbyl-2-polyphosphate, riboflavin supplement, thiamine mononitrate, pyridoxine hydrochloride, biotin], minerals [zinc sulfate, ferrous sulfate, manganous sulfate, magnesium sulfate, copper sulfate, cobalt carbonate, calcium iodate, iron proteinate, zinc proteinate, copper proteinate, manganese proteinate, magnesium proteinate, cobalt proteinate], dried Lactobacillus acidophilus fermentation product, dried Bifidobacterium longum fermentation product, dried Lactobacillus plantarum fermentation product, dried Pediococcus acidilactici fermentation product. Born Free Garrison’s Glen™ with Chicken, Duck and Turkey Grain-Free Adult Dog Food is formulated to meet the nutritional levels established by the AAFCO Dog Food Nutrient Profiles for growth and maintenance. beef, pork meat meal, lentils, peas, chickpeas, pea flour, lamb, dried whole egg, pork fat (preserved with mixed tocopherols), dried tomato pomace, pork liver, pea protein, sweet potatoes, salmon oil (preserved with mixed tocopherols), flaxseed, alfalfa meal, carrots, broccoli, spinach, potassium chloride, salt, chicory root extract, yucca schidigera extract, sodium selenite, folic acid, parsley, sorbic acid (preservative), vitamins [vitamin A acetate, vitamin D3 supplement, vitamin E supplement, vitamin B12 supplement, choline bitartrate, niacin supplement, d-calcium pantothenate, L-Ascorbyl-2-polyphosphate, riboflavin supplement, thiamine mononitrate, pyridoxine hydrochloride, biotin], minerals [zinc sulfate, ferrous sulfate, manganous sulfate, magnesium sulfate, copper sulfate, cobalt carbonate, calcium iodate, iron proteinate, zinc proteinate, copper proteinate, manganese proteinate, magnesium proteinate, cobalt proteinate], dried Lactobacillus acidophilus fermentation product, dried Bifidobacterium longum fermentation product, dried Lactobacillus plantarum fermentation product, dried Pediococcus acidilactici fermentation product. Born Free Redwood Ranch™ with Beef, Lamb and Pork Liver Grain-Free Adult Dog Food is formulated to meet the nutritional levels established by the AAFCO Dog Food Nutrient Profiles for growth and maintenance. Age, breed, weight, activity level, and other factors have an effect on the amount of food required. Two to four times more food may be required for gestating or nursing dogs. Spayed or neutered dogs may require up to 25% less food. salmon, salmon meal, peas, chickpeas, lentils, potatoes, pea flour, trout, dried whole egg, tomato pomace, pork liver, pork fat (preserved with mixed tocopherols), sweet potatoes, salmon oil (preserved with mixed tocopherols), flaxseed, alfalfa meal, carrots, broccoli, spinach, potassium chloride, salt, chicory root extract, yucca schidigera extract, sodium selenite, folic acid, parsley, sorbic acid (preservative), vitamins [vitamin A acetate, vitamin D3 supplement, vitamin E supplement, vitamin B12 supplement, choline bitartrate, niacin supplement, d-calcium pantothenate, L-ascorbyl-2-polyphosphate, riboflavin supplement, thiamine mononitrate, pyridoxine hydrochloride, biotin], minerals [zinc sulfate, ferrous sulfate, manganous sulfate, magnesium sulfate, copper sulfate, cobalt carbonate, calcium iodate, iron proteinate, zinc proteinate, copper proteinate, manganese proteinate, magnesium proteinate, cobalt proteinate], dried Lactobacillus acidophilus fermentation product, dried Bifidobacterium longum fermentation product, dried Lactobacillus plantarum fermentation product, dried Pediococcus acidilactici fermentation product. Born Free Cutter’s Creek™ with Salmon and Trout Grain-Free Adult Dog Food is formulated to meet the nutritional levels established by the AAFCO Dog Food Nutrient Profiles for growth and maintenance.